Yea! Eddie Shoes is back in another page turner. 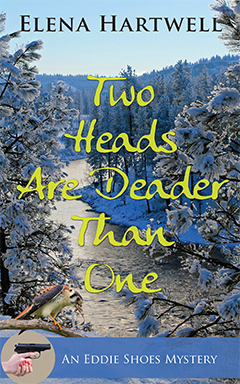 TWO HEADS ARE DEADER THAN ONE is book two in the Eddie Shoes Mystery series. I read ONE DEAD TWO TO GO (book one in the series) and felt it was a great debut for Elena Hartwell. It was entertaining to get a feel for Eddie's personality and insight into her unique background as I followed the action. So I had high hopes for the second book. TWO HEADS ARE DEADER THAN ONE doesn't disappoint. This time Eddie is dealing with the fallout from the return (and then disappearance) of her childhood friend, Dakota. The fallout includes dead bodies and clues that point to Eddie as a perpetrator. Yikes! Eddie describes her skill set as "more about patience, work ethic, and attention to detail than sharpshooting and tailing criminals." She describes Chava as "well suited for the role of amateur sleuth" - meaning she is nosy and not afraid of a little danger.Together, they make clever and funny mother-daughter crime-fighting duo. The unique cast of supporting characters is back to support her as well. I was glad to see that Eddie's huge dog Franklin (a Tibetan Mastiff-Irish Wolf Hound mix) is blending into her daily routine. Haven't read book one yet? No problem. New readers to the series should be able to jump right into the story. Hartwell provides enough detail to get them up to speed without slowing down those who have read book one. Eddie's witty no-nonsense personality and Hartwell's well-paced writing style make the chapters fly by. This book is a buy. I voluntarily reviewed a complementary copy of this book in conjunction with this tour. 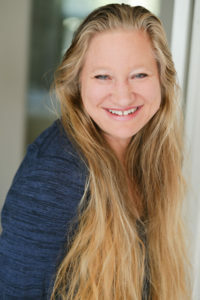 In addition to her work as a novelist, Elena teaches playwriting at Bellevue College and tours the country to lead writing workshops. When she’s not writing or teaching, her favorite place to be is at the farm with her horses, Jasper and Radar, or at her home, on the middle fork of the Snoqualmie River in North Bend, Washington, with her husband, their dog, Polar, and their trio of cats, Jackson, Coal Train, and Luna, aka, “the other cat upstairs.” Elena holds a B.A. from the University of San Diego, a M.Ed. from the University of Washington, Tacoma, and a Ph.D. from the University of Georgia.